Keep your eyes peeled for signs of neuropathy. Diabetes mellitus, or sugar diabetes, is an affliction common to older cats. Among its complications is neuropathy, or pain and numbness in the extremities. You'll slow the condition's progression if you detect diabetic neuropathy early, so it's important to know and watch for its symptoms. Feline diabetes occurs when your cat doesn't produce enough insulin, the substance responsible for regulating blood glucose levels. 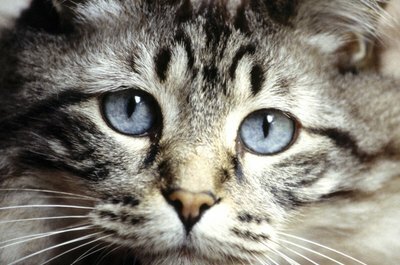 Without insulin, glucose builds up in your cat's blood to damage the blood vessels, tissues and nerves in the ends of her limbs. This damage can cause chronic pain and mobility problems for your furry friend. If your kitty has been diagnosed with diabetes, your veterinarian has probably told you to be on the lookout for signs of diabetic neuropathy. 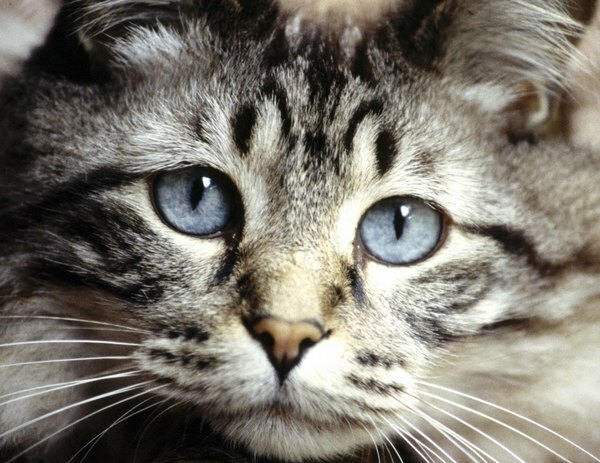 Often, these signs are the first indication your feline has diabetes. You might see your cat limping or dragging a limb, especially in the hindquarters, or she might falter and lose her balance frequently. Another telltale sign of neuropathy is walking on her hocks or ankles. Other symptoms include shaking or twitching of the skin, chewing on the affected area and muscle wasting or atrophy. If you notice any of these behaviors, have your vet rule out other conditions that might cause the same results. Also be alert for signs of diabetes so you can begin to manage the disease before it causes neuropathy. Symptoms of diabetes include excessive thirst and frequent urination. You might notice your kitty has a ravenous appetite but is losing weight. Diagnosing diabetic neuropathy depends mostly on viewing the mobility changes in your cat. When you bring these changes to your veterinarian's attention, she will likely recommend urine and blood tests to determine whether your feline friend has diabetes. A positive diagnosis of diabetes combined with visual symptoms are a good indication your cat has diabetic neuropathy. Your first weapon in fighting diabetes and the related neuropathy is diet. If your cat is overweight, it will affect insulin effectiveness. Your veterinarian can prescribe a diet for safe, gradual weight loss. Feeding a food that's high in fiber and complex carbohydrates will help control blood glucose levels and help shed pounds. If diet won't solve it, your cat may need insulin injections or oral medications, which will require veterinary monitoring and adjustment. As the diabetes comes under control, the progression of neuropathy will slow or stop. Vitamin B12 and methylcobalamin, a derivative of B12, may be able to reverse some diabetic neuropathy effects; ask your veterinarian about the latest developments. With proper diet, medication and monitoring, your diabetic cat can live many healthy years.